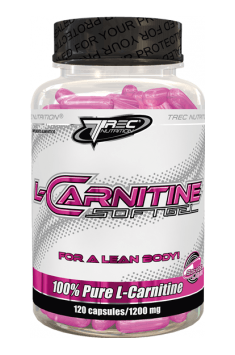 Trec L-Carnitine SoftGel contains liquid L-carnitine enclosed in easy-to-swallow gel capsules. The substance participates in the transport of medium- and long-chain fatty acids into the mitochondria, allowing them to be used for energy purposes. L-carnitine increases the perceived energy level, promotes weight reduction and improves the exercise capacity. L-carnitine - is one of the endogenous amino acids formed from lysine and methionine; also belongs to vitamin-like substances. L-carnitine occurs naturally in food of animal origin, especially in red meat, and it is not available in plant products. L-carnitine is responsible for the transport of medium- and long-chain fatty acids (over 12 carbon atoms) to the inside of the mitochondrion. The fat molecules are activated to esters of Coenzyme A (CoA) and then esterified to L-carnitine. The enzyme acting outside the cell membrane which is responsible for this reaction is carnitine palmitoyltransferase I and the carnitine palmitoyltransferase II, which releases fatty acids, is activated inside the cell. Thanks to this, they can be used for energy purposes and undergo beta-oxidation. The mechanism described above facilitates the possibility of using fatty acids as a source of energy, which positively affects the process of weight reduction. It was observed that people supplementing L-carnitine on a hypocaloric diet showed a significantly greater decrease in fat mass than the placebo group. It probably involves insufficient endogenous production of the amino acid and too low supply from the diet. It is believed that L-carnitine deficiency may be one of the factors limiting the process of reducing body fat. L-carnitine improves anaerobic endurance during physical exercise, and also increases the production of nitric oxide, which ensures efficient blood transport in the body. Reduced lactic acid production has also been shown, which delays the appearance of fatigue and prolongs the time of physical exertion. L-carnitine also contributes to the reduction of muscle damage caused by training, which shortens the time needed for recovery and reduces the occurrence of muscular pain. L-carnitine ensures efficient work of mitochondria which are responsible not only for the production of energy, but also for getting rid of free oxygen radicals. In people consuming L-carnitine, an increase in the activity of antioxidant enzymes such as glutathione peroxidase or superoxide dismutase was noticed. L-carnitine seems to be an amino acid that supports the functioning of mitochondria, and its consumption positively affects their quantity and efficiency. L-carnitine, due to improving the functioning of mitochondria, is used as a support for therapy in people suffering from chronic fatigue. The disease is probably related to, among others, improperly functioning mitochondria that do not produce enough energy. L-carnitine supplementation also improves cognitive functions, mood and mental performance, although much better results are obtained by supplementing the amino acid enriched with the acetyl group - acetyl L-carnitine. L-carnitine supplementation positively affects the optimization of the glucose metabolism of the body. People taking this amino acid had a significantly lower level of fasting insulin and HOMA-IR index than people using the same dietary recommendations, but without supplementation. L-carnitine also improves the insulin sensitivity of tissues, thereby reducing insulin resistance which prevents glucose from entering the cells. In conclusion, Trec L-Carnitine SoftGel is a dietary supplement containing pure L-carnitine which participates in the energy metabolism of the body. The preparation promotes the improvement of the exercise capacity, allows the use of fatty acids as a source of energy and improves the work of mitochondria. Gel capsules provide convenience of use. Take 2 capsules 2 times a day, preferably 30 minutes before a meal. The preparation is recommended especially for people that may have L-carnitine deficiency due to using a diet that excludes products of animal origin. In order to support the reduction of body fat, it is recommended to take a portion about 30 minutes before an intense physical exertion, and additionally it can be combined with caffeine. To support the work of mitochondria, it recommended to combine the product with coenzyme Q10, resveratrol and PQQ. MCT Oil, Capsule shell (Gelatin), Stabilizer (Glycerol, Beeswax, Sorbitol), Emulsifier (Soy lecithin), Coloring agents (Titanium dioxide, E120, E129).